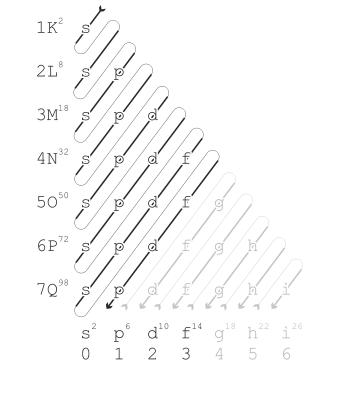 In the periodic table of the elements, elements are arranged in a series of rows (or periods) so that those with similar properties appear in a column. Elements of the same period have the same number of electron shells; with each ក្រុម across a period, the elements have one more proton and electron and become less metallic. This arrangement reflects the periodic recurrence of similar properties as the atomic number increases. For example, the alkaline metals lie in one group (group 1) and share similar properties, such as high reactivity and the tendency to lose one electron to arrive at a noble-gas electronic configuration. The periodic table of elements has a total of 118 elements. Seven periods of elements occur naturally on Earth. For period 8, which includes elements which may be synthesized after 2012, see the extended periodic table. Period 5 contains the heaviest few elements that have biological roles, molybdenum and iodine. (Tungsten, a period 6 element, is the only heavier element that has a biological role.) It includes technetium, the lightest exclusively radioactive element. All elements of period 7 are radioactive. This period contains the heaviest element which occurs naturally on earth, californium. All of the subsequent elements in the period have been synthesized artificially. Whilst one of these (einsteinium) is now available in macroscopic quantities, most are extremely rare, having only been prepared in microgram amounts or less. Some of the later elements have only ever been identified in laboratories in quantities of a few atoms at a time. Although the rarity of many of these elements means that experimental results are not very extensive, periodic and group trends in behaviour appear to be less well defined for period 7 than for other periods. Whilst francium and radium do show typical properties of Groups 1 and 2 respectively, the actinides display a much greater variety of behaviour and oxidation states than the lanthanides. Initial studies suggest Group 14 element flerovium appears to be a noble gas instead of an other metal, and group 18 element ununoctium probably is not a noble gas. These peculiarities of period 7 may be due to a variety of factors, including a large degree of spin-orbit coupling and relativistic effects, ultimately caused by the very high positive electrical charge from their massive atomic nuclei.